Please use the ASK OWNER A QUESTION button to inquire and correspond about booking this property to make sure the dates are available and price is agreed upon prior making the reservation. • Located very close to the children's splash area and BBQ grils. • Free covered parking garage for easy unpacking. • NO stairs to climb or elevators to wait on. • Beach Service - Two Chairs and an Umbrella available March - October. • Private balcony. You will enjoy the mornings planning your day watching the sunrise, without the pool activity. • A227 is on the upper pool level that is heated in the off season and close to BBQ grills, just 100 feet down the hall to the pool NO STAIRS OR ELEVATOR. • 50 feet to your car in the covered garage. Forget something in the car? No problem. • Owner takes care of all guests and you can call my cell anytime. • Price is very competitive. Waterscape is located on what is known as Florida's Emerald Coast which is comprised of three communities including: Destin, Fort Walton Beach and Okaloosa Island. The readers of Southern Living Magazine in 2009 and 2010 rated Fort Walton Beach/Destin the #1 Beach Resort in the South. As our guest you get all of the amenities provided at the Waterscape. Our unit is located on the second floor with direct access to the upper level amenities including children's playground, BBQ grills, gazebo, pool (heated). The lower level of Waterscape amenities include Lazy-River, BBQ grills, zero enty pool, On-site Dining on the pooldeck (Tiki Bar open seasonally for casual food and drinks), 2 Hot Tubs, Fitness center (with LCD HDTV screens on all 'Life Fitness' exercise equipment/machines: 3 treadmills, 3 elliptical machines and 2 bicycle machines) overlooking the pool/waterfall, and handicapped accessible boardwalk leading to 490 feet of pristine beachand beach access. 2 bedroom (King Size Beds) condo with a bunk room and pull out couch, provides plenty of room (1,292 square feet) and space for your whole family (sleeps eight). Each bedroom has its own private full bath with separate tub and shower, and its own LCD TV with cable and DVD. The unit has a full kitchen, washer and dryer, and FREE Wireless Internet access. We offer specials rates for Snowbirds please call or e-mail for more information. I go out of my way to make sure all my guests have a good stay. Large bathrooms with big showers and tubs. Waterscape property is a beachfront property. No crossing streets to access the beautiful Florida beaches. Keeps the car nice and cool in a secure parking garage. Our location makes loading and unloading very easy. Fitness room has multiple treadmills and weight-lifting machines with an excellent view of the pool. Excellent area designed for all ages. Lazy River, Waterfall, zero-entry entrance for toddlers, and heated upper pool. Fitness center with weight room and a variety of cardio machines. Covered parking, park at your floor. Lay-Z-River, three pools, treadmills, children's water park, waterfall. My family and I were quite pleased with our stay. And as always, the Waterscape did not disappoint. This is our 2nd stay on the property and first in this unit. The owners were awesome - they were great with communication and super helpful. The posted pictures accurately reflect the accommodations. IMO I don’t think there’s a bad spot @ Waterscape and while it would have been nice to have a better water view and a shorter walk to the beach; having 4 young kids and being close to the parking ramp, using no elevators and near the zero-depth pool, playground and grill made it all worth it. The space itself was comfortable with king beds, a chess/checkers board table, a large dining room table and everything one needs for a quality stay—I highly recommend this unit; you will not be disappointed! 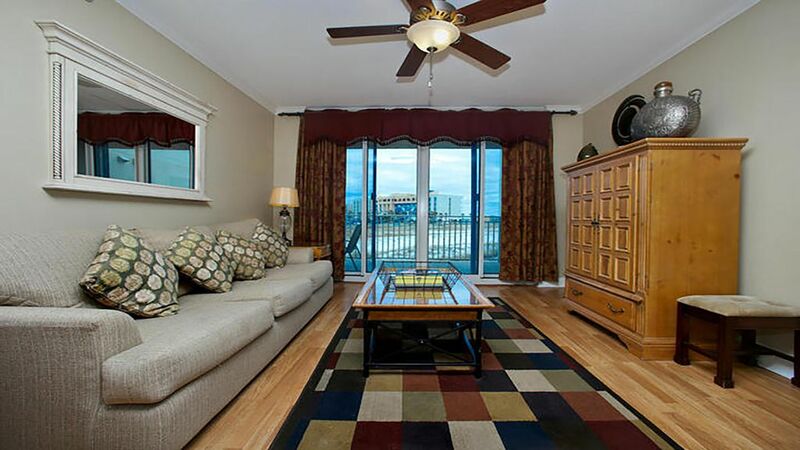 This condo is great for up to four adults and 4 or 5 kids. The layout is great and the amenities are wonderful. My kids especially loved the bunk room! The king beds were not the most comfortable I’ve ever slept on, but it wouldn’t deter me from visiting again. Just something to consider if you have back problems. The owners are great with communication and happy to help if needed, although we didn’t need anything because they did such a great job getting everything ready! Absolutely beautiful and exactly as pictured. Will definitely try to go again. Was just what we wanted. Fantastic condo....location, size, clean and safe. The directions given to me on all aspects of the condo location, parking location, what was included at the condo, and any and all other information was superb. I only wished I had a few of the beach. My landlord was fantastic and helping me and all my concerns and or questions. Overall great condo... plenty of room and loved the 2 bedrooms both with king size beds! Easy access to the kids splash area and heated pool. A few things I would have preferred....1. specific instructions on where to park and how to find this room. The property is very confusing. 2. Wish there would have been basic supplies...such as dish soap, extra garbage bags, hand & bar soap for sinks & showers, extra toilet paper and paper towels....etc. Stayed 5 nights and had to buy all of these things the first day. The Emerald Coast Science Center offers children of all ages a hands-on encounter with science. More than 250 interactive exhibits teach visitors about natural phenomena and applied science. Florida's Gulfarium is home to an amazing menagerie of aquatic life, including bottlenose dolphins, California sea lions, tropical penguins, American alligators, moray eels and sea turtles. A 60,000-gallon living sea aquarium and a 400,000-gallon dolphin tank provide homes to an array of marine species native to the northwest Florida waters. Other animals at Florida 's Gulfarium include: seals, sharks, stingrays, pelicans and more. # There are several shopping plazas in the Destin and Fort Walton Beach area. The newest shopping center is the 590,000-square-foot Destin Commons - an open air, upscale shopping center just 20 minutes from Waterscape. Destin Commons features a 14-screen RAVE Motion Pictures theater and a Bass Pro Shops World Wide Sportsmen - one of only two in the United States. Rates do not include tax, cleaning fees. No charge for Beach Service (Two Chairs and an umbrella) during March - October.